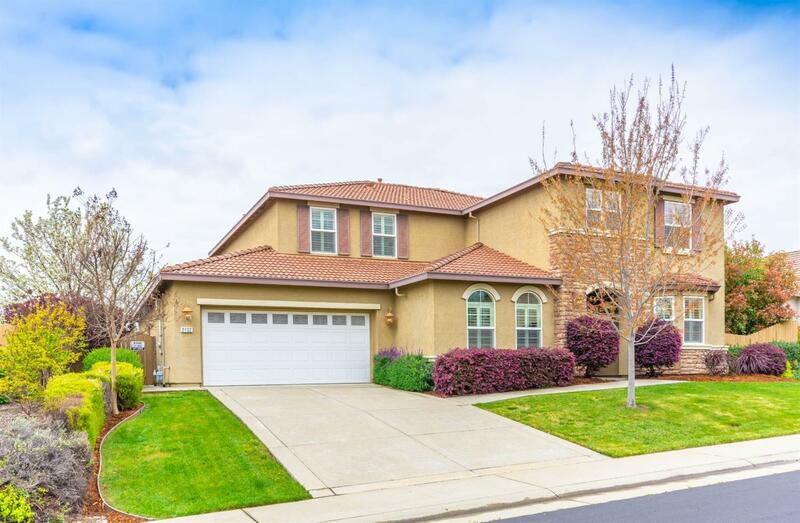 Do not miss this beautiful home in the highly desirable Stoneridge neighborhood! Boasting plantation shutters throughout, stainless steel Kitchen-Aid appliances, 6 burner commercial stove & double ovens, granite counters with maple leaded glass cabinets, and huge Butler pantry. This home shows beautifully! The master suite features a 2 sided fireplace, jetted tub, and a spacious master bathroom with dual shower heads. The downstairs features an Open formal Dining and Living rooms including downstairs Bedroom with Full Bath. Recent additions include new maple cabinets in the downstairs Family room and Bonus room upstairs adding more living space for the entire family. Gorgeous lawn, shrubs, and trees. Fenced backyard with new custom built Pergola. Includes a 3 car garage and room for RV access. Centrally located in a wonderful neighborhood. Short distance to schools, parks, creeks, and trails. Close to restaurants, shopping, and medical facilities. No Mello Roos or HOA!